A Delta II rocket lifted-off from Vandenberg AFB on 2008 October 24 and successfully placed Italy's COSMO-3 radar imaging satellite into orbit. The event occurred during the early evening and was widely seen. Aerospace photographer Brian Lockett took this panorama of the launch near Refugio Pass. California. He used two Nikon digital cameras to take separate time exposures of different portions of the launch and later joined the images. Copyright 2008, Brian Lockett. All rights reserved. Used with permission. 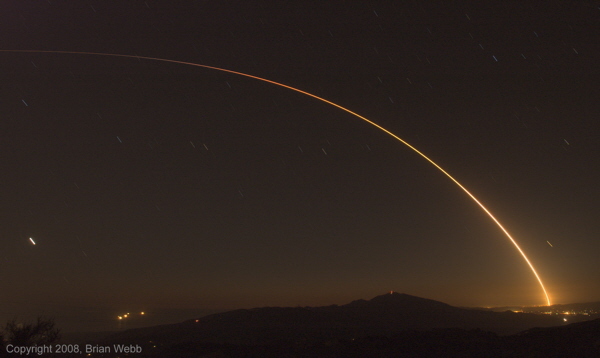 The webmaster recorded the initial portion of the Delta II / COSMO-3 launch in this 182-second time exposure taken from the mountains north of Santa Barbara, California. The equipment consisted of a Nikon D70 digital SLR set to ISO 200 with no noise reduction and a zoom lens set to 18mm and f/8. Visible in the lower left are the trail from the planet Venus and the lights of oil drilling platforms Honda, Harmony, and Heritage in the Santa Barbara Channel. Broadcast Peak is near the bottom center of the image. Copyright © 2009, Brian Webb. All rights reserved.